Pre-Separation or Orthodox component meetings were: Goshen Preparative, Newtown Preparative, Willistown Preparative and Whiteland Preparative. Hicksite branch component meetings were: Goshen Preparative, Newtown Preparative, Whiteland Preparative and Willistown Preparative. The Hicksite Goshen Preparative was the forerunner of the modern day Goshen Monthly. Set up in 1702 as an indulged meeting by Chester Monthly and 1703 as a preparative meeting in 1703. 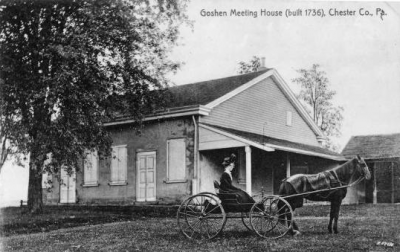 When Goshen Monthly was established in 1722, this meeting became part of it. At the time of the Separation, the Hicksite branch retained the meeting house and burial ground. 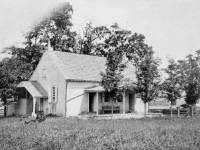 Both branches continued to use the meeting house until 1849 when the Orthodox branch purchased land adjoining the original meeting, building a small meeting house and laying out a burial ground.